We had a crazy overspending month – the first one we’ve had in a long time! We are just no good at denying ourselves in the grocery store. We didn’t have too many random expenses – most things we were able to cover out of our nest egg. We are definitely done paying ourselves back for our moving expenses – we may have even been done last month but we haven’t squared all of our account balances from our apartment. As of October we still hadn’t yet fully updated our budget to reflect our raises and rent savings. We were still considering whether we want to reserve distributing our freed-up income until we know how our taxes will change. We did adjust our tithe but we haven’t yet increased our Roth IRA contributions. INCOME: Same as last month from grad school, plus Kyle got a small paycheck for his side hustle. SAVINGS: This was one of the four months of the year that we made 5 weekly contributions to Kyle’s Roth IRA, which is so annoying. So that’s where a lot of our extra money went. Kyle finally agreed to switch to bimonthly contributions like I do instead of weekly; I’m waiting for the new year to implement that change. GIVING: New tithe rate! Plus we tithed on Kyle’s extra paycheck. I’m not sure how this will work out in the long run since his pay will be irregular. I guess we can just make an extra transfer to the church every time he gets paid. Rent: Rent is still $895 but we put the extra rent savings into our nest egg to repay ourselves for our move. Internet: We actually paid a couple bucks extra on our internet this month. When our bill came in it said that there had been leftover charges on the account and Kyle wouldn’t let me call to inquire what they were from (he’s much less assertive than I am). Groceries: We went waaaaaaaaay over our grocery budget – like $80 over! That hasn’t happened in a while so I guess it was due. I’m not really sure why we were over as we didn’t buy anything out of the ordinary so maybe it was just the way our shopping cycle fell with the dates this month. Gas: Not much to notice here. We actually spent more on gas because of Kyle’s departmental retreat but I refunded us from travel savings. Restaurants: Lots of eating out (for us) this month – and we didn’t pay for most of it! We ended up just barely exceeding our budget, so that’s not so bad. Kyle’s friend treated him to lunch for driving him to their departmental retreat. We went out to dinner with some friends after hiking in a local state park and we both ordered seafood dishes, so it ended up being a pricey meal for us. My parents also took us out to dinner when they were in town, so we had good Indian food that night. While I was out of town Kyle went out to dinner with some of our friends and also got a meal from a food truck. Not included in this figure are all the charges I racked up when I went out for every meal while at my conference ($134.67). I’m expecting a full reimbursement and hope that will come through quickly. 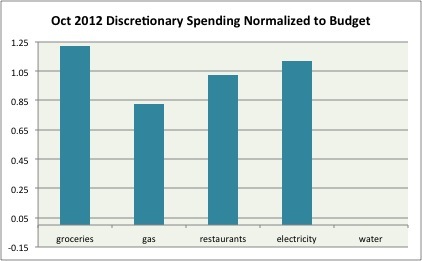 Electricity and Gas: I’m still not sure what our budget should be here, but we spent more than $100 between our two types of bills. Water: Apparently we are only being billed for water every other month, and we haven’t received our bill yet… I’m not sure what’s going on. I set aside $70 from this month’s budget to cover the last two months, though. We thought Kyle’s department was going to pay his activity fee but it looks like they didn’t, so we’re out $16.25 to the Bursar. In total, we spent $807.85 out of our savings accounts and added $167.02 to them on top of our regular savings this month. We pulled $40.48 out of this account to reimburse ourselves for the gas Kyle spent driving to his retreat. For adding our second car back onto our car insurance for one day we were charged $1.24. There was actually a problem with this – they added the car back on but the order to take it off never went through so we had to sort that out. Kyle paid his half of our parking permit for $151.50. We added the non-obligated portion of Kyle’s sidle hustle paycheck to this account, $43.41. We spent $59.35 on food to provide a snack to ESL students who have lessons on Saturday mornings at a local church. We always over-provide food so we packed up the leftovers as take-away plates. Our October rent savings of $110 went into this account. We spent $67.88 on storage containers for our china. In our last place we had so much closet space we didn’t have to unpack most of our china from their original and space-inefficient boxes but now we don’t have that luxury. We were expecting to spend $60 on a bookcase for our new place but my parents decided to buy one for us for a housewarming present! We spent $25.44 on a new bath mat for our guest bathroom because we ruined our last one by leaving a bunch of our cleaning supplies in a trash bag on the bath mat for two weeks and the trash bag leaked. Also some washcloths. I put the additional amount we needed to sequester from Kyle’s side hustle paycheck ($13.61) into this account since Kyle didn’t want to open a new savings account for taxes. Kyle and I are overdue for a budget adjustment discussion but we haven’t found time to do it in a serious way yet. We are definitely done paying ourselves back our rent savings so maybe we will just put it into Travel if we can’t decide how to divvy it up in the next month. Bottom line: We barely squeaked by in the black this month, thanks to 1) our raises from September that we haven’t yet incorporated into the budget and 2) Kyle still not having a cell phone. We had $33.68 in leftover money that we transferred to our Travel and Personal Gifts account. What’s the last budget category you really blew? How long does it take you to update your budget after you have a qualifying event? 5 Responses to "October 2012 Month in Review: Money"
We don’t have a good budget yet. 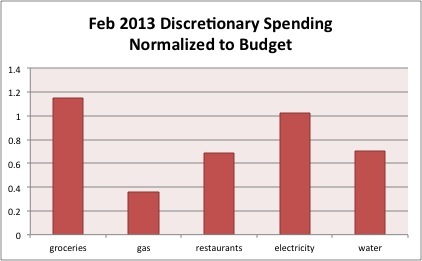 But we spent far more than normal on gas because of lots of weekend travel. We’ll probably wind up with a ton of grocery spending this month, thanks to the holiday and the fact that we ate through almost our entire pantry in October. SWR recently posted..Having a baby in grad school? We try to smooth out all our abnormal spending using our short-term savings accounts, so things like gas for weekend travel come out of there. I guess we ended up spending $15 on candy that we normally wouldn’t have because of Halloween! Are you still working on your budget because of your boyfriend’s recent employment? We are determined to sit down and have a budget adjustment meeting THIS month! The last budget category that I really blew is probably clothing? Buying shoes online and fronting the money for several sizes results in definite budget blowing until the money is refunded. October was an absolutely terrible month for expenses for me (more on that in tomorrow’s post). As for cell phones, I have a feeling that I will end up buying a Nexus 4 and switching back to T-Mobile prepaid since their plans are so awesome within the year. As far as the money I expect to be refunded goes, I’m just sort of ignoring it on our credit cards since it should come soon – I don’t know if I would do the same for personal purchases as I might take a long time to return them. I’ve definitely overspent our clothing savings account for dresses for weddings! I was sort of waiting for the fiscal cliff to resolve itself to redo the budget but now I see that being put off well into 2013 so we may as well adjust it now. I don’t think our long-term savings will change at all since there is so much more we want to do with short-term savings. Haha, I don’t see that happening anytime soon. Remember last year how they extended the 2% Social Security tax paycheck cut in late December and then in late February extended it for the whole year? My plan is to not do any math on that until I get my January pay stub and until then, just carry on as normal.